What did your fix today? We stumbled up Mrs. Mohan’s ingenuity on facebook. 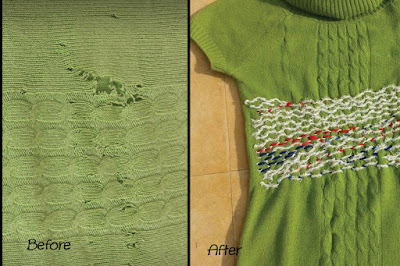 Carefully patched up broken pot, a torn sweater stitched back to life. Her work resonated with what repair café Bengaluru stands for. Care giving is a response that we human being are capable of unlike any other species and positive response of care and empathy can bring about a sense of goodwill not just in our lives but in society at large. Repairing to us is an extended care-giving platform; it’s a stance that we take, a decision, a choice that can have rippling effect in the generation to come. Here’s some of her work in visuals and some wise words. When i started "saving and reusing" things there were no environmental issues. Atleast they were not discussed. I remember about 35 years ago I mended a blanket that was accidentally burnt by hot iron. I had cut round discs from a leftover woolen piece and covered the hole on both sides. My mother in law would show it to everyone appreciating my work ! I have been doing such things with discarded pieces of cloth, making table covers, bags and toys for my dogs. It was some 10 years ago that i got passionate about environmental issues especially plastic waste. Working in a college I found an opportunity to educate students. Together we would find ways to use green options and reduce waste as much as possible. At home i make compost from kitchen waste. I also used my garden waste for aerobic composting. We dont 'buy' plastic as such but old plastic containers and bottles are used as planters. When our house was painted, i collected all the paint buckets and made designs on them to be used as pots at bangalore. Same with extra waste paper baskets. 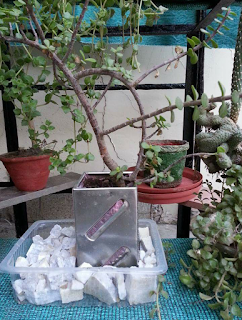 I have grown plants in a broken scrapper and discarded utensils. I try to mend things that are usually thrown away. Small plastic bottles of milk and lassi are used for keeping condiments, empty cardboard boxes of liquor etc for keeping small boxes handy. 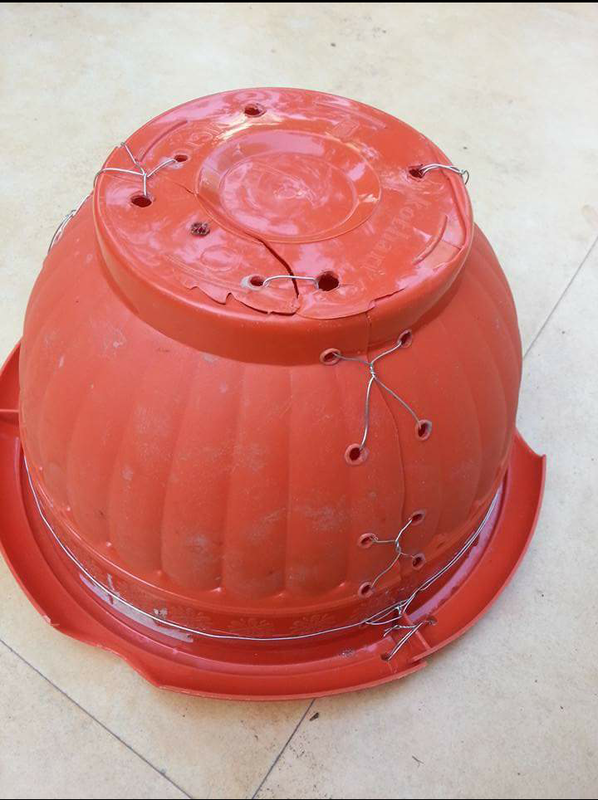 The grow bags are painted and used as pots. So are coconut shells. Recently i made cushion covers from a silk saari. We’d like to thank Mrs Mohan for her contribution to our blog. We hope that her tribe grows in leaps and bounds. - Repair revolution is catching up in the west in the last 5 years or so,indeed they make E-waste 10 fold more than asian countries. RepairCafe Bengaluru believes there's a growing need to change or relook policies, specially in our education system by linking environment to technology and repair to life skills. In the UK in past, people learned to replace plugs on electrical appliances at school. However, repair in schools has suffered as Design and Technology (DT) was withdrawn as a compulsory subject and decreases in size. And many initiatives promoting STEM (Science Technology Engineering Maths) enrichment are keen on disassociating them from repair, which is claimed to have a ‘low status’. The persistent notion that repair is ‘low status’ is nonsense, especially given the growth of sensor networks, smart cities and smart homes, which will necessitate more maintenance and repair than ever. These will be some of the most reliable jobs in an age of automation and outsourced everything. Not to mention that repair teaches some of the most transferrable skills: (creative) problem-solving, team work and it serves as a real confidence-builder. Also, what is the consequence of schools accepting and reinforcing this ‘low status’ attached to repair and care, in an age of shrinking education budgets? How can schools continue to ignore care and repair of their own computers? Lastly, if in the UK students attempting to get a place at universities, as elsewhere, are judged on their contributions to community and civic spirit – what better way to achieve this, than through activities like the Restart Party or Réparothon, providing a service to the community and sharing valuable skills. This above piece is a data reflected from an international charity working on repair as a mainstream skill and concern in UK. 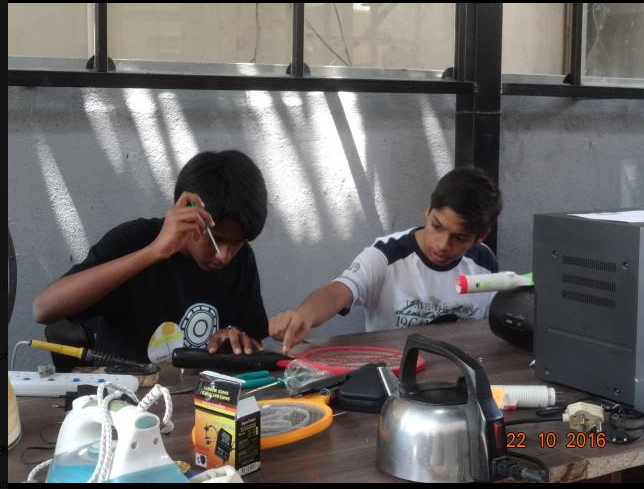 Repair cafe Bengaluru is eager to work it's way forward in introducing repair courses and enrichments in schools across Bangalore. Life comes a full circle, it’s such a cliché but living or experiencing life lessons is a must to realize why some of our old practices are worth following and keeping up with. While I knew the need to evoke the dormant repair gene in us, direct involvement makes me sit up and ponder rather reflect how my own mindset have changed over the years. Many years ago I remember during vacation time, I recall my mother carrying a sewing box in her travel bag. I did not understand why she would bother to carry it on a vacation. I mean sewing is chore, and we were on a holiday! I just could not understand! And 20 years hence here I am carefully tucking a sewing kit in my travel bag. Well it’s amusing that I woke up to the wisdom only when I had a child of my own knowing that he cannot keep a pair of shoes in shape for more than a month. So in May when we took a short vacation, the very first day we had a torn shoe and a Cap and we were in the middle of a coffee plantation. Not a soul around, apart from our hosts in the vicinity. While sipping my aromatic coffee in the evening I took out my sewing kit and voila sewed the sandals (thankfully it was a manageable tear) and patched the cap. It was such a pleasure to fix things. Contentment beyond words. 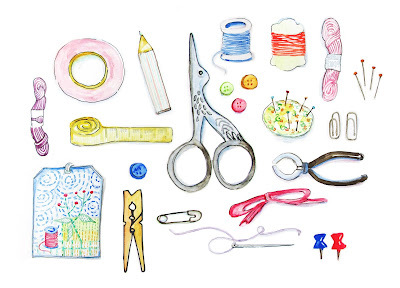 So next time you are on vacation, who knows travelling with a sewing kit may prove to be a blessing for you as well! 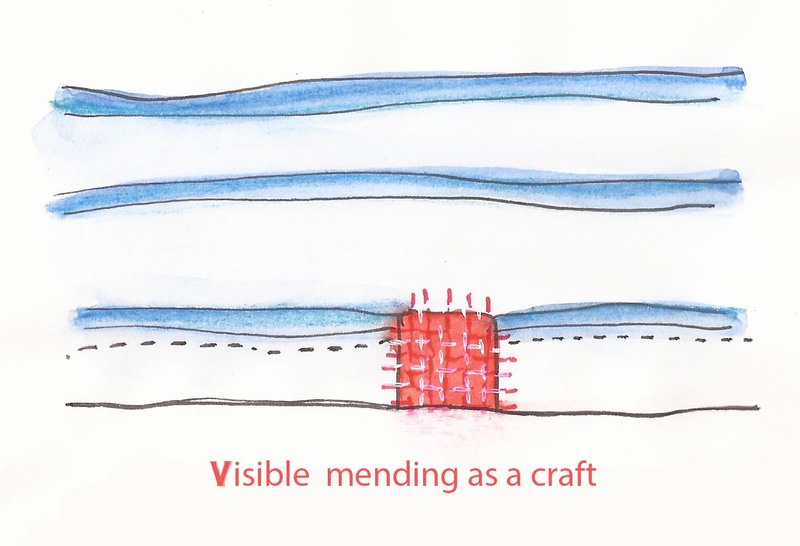 Mending as a Preservation Craft. Human brilliance is undermined by none other than fellow humans. Millions of years ago when men strived to improve his living conditions and struck upon fire it was the triumph of human will and determination. We have come a long way since then and once again there is a calling to weather the test of time with sheer human determination. Today as we sit on the edge of a manmade climate calamity that nudges our doors, it may be wise to turn around and look for simple yet effective responses or traditions that our older generations pursued. Human traditions always had a deeper meaning that most of us can decipher in our lifetime. Over the last 3 or 4 decades these values has either been misplaced or forgotten by the following generations, thus causing a wave of stupendous blunders. Repair is sidelined in the modern world or better forgotten. The consumerist mindset or the market that drives the ‘new’ can’t possibly pay any heed to repair. If I talk of India, repair has always been an obvious solution for dysfunctional items but that was a few generations ago. With a drive for growth and progress came literacy (or the mere ability to read and write), which somehow brought about a generalized indifference for both natural and manmade resources giving way to resource illiteracy. Literacy got misunderstood as education and in the name of progress mindless exploit of resources became a regular practice. Technology perhaps played very pertinent role here. By resource illiteracy I only imply a certain distancing from the wisdom of all possible resources around us. This wisdom came about by being part of various everyday processes. A man working in a cotton mill may have been familiar with season and soil, the cotton would grow, he was in tune with the whole milling process (perhaps simple machines) as well as the finished product and also it’s life cycle. With fast pace globalization, technological advancement and scale of operations, valuation of all resources is now reduced to mere costs, this indeed is a great tragedy of our times. Globalization and industrial dynamics at a cost of local indigenous processes, disconnects not only end consumer but also most of the people who are part of remote operations of a very complex global matrix. For example cotton from India, spun and processed in Bangladesh, manufactured into clothes in Srilanka or Vietnam and sold in Europe. The urban diaspora in particular, appears to be handicapped in this scenario, we in the quest for comfortable and a convenient lifestyle has given way to huge amount of waste, resource underutilization and abuse. We dwell in out of context ideas and products, living in a conceptual world distancing ourselves from physical realities that actually surround us. Last week I was part of the 6th edition of Repair Café Bangalore. Repair café Bangalore is part of the Repair café Foundation based in Netherlands. Repair cafés are places where a functional repair workshop is carried out with the help of local hosts, citizens, repair specialists and volunteers. An old gentleman serving the Indian Navy told us an interesting story. 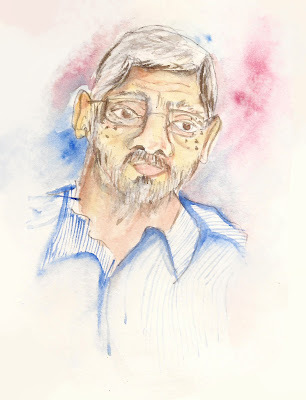 He was part of the naval base in Chennai way back in 1940’s. An annual customary meet-up with their British counterparts had the visitor taken aback. In the ship they noticed a dated piece of machinery, which has been discontinued in the British ships long time back, still running with gusto. The chief of the Indian Navy contingent laughed and said, in India we can repair anything. Repair has deep rooted significance in most of living cultures around the globe. Preservation and forwarding life (as we know it today) may have been the most poignant lesson man has taught his children in the past. Celebration of what exist and what’s in use was a determining factor in our traditional practices. Passing of this wisdom was equally important. Kantha, is a traditional Indian duvet or comforter also a bed liner for the new born, an expression of frugality at it’s best. In Bengal the summer are intense and lasts long, With the birth of a new baby the grandmother or the elderly at home would stitch a multi-layered comforter with old cotton saris completely handmade. A tedious process that needs exceptional patience but working in bits and pieces the katha would come to life. 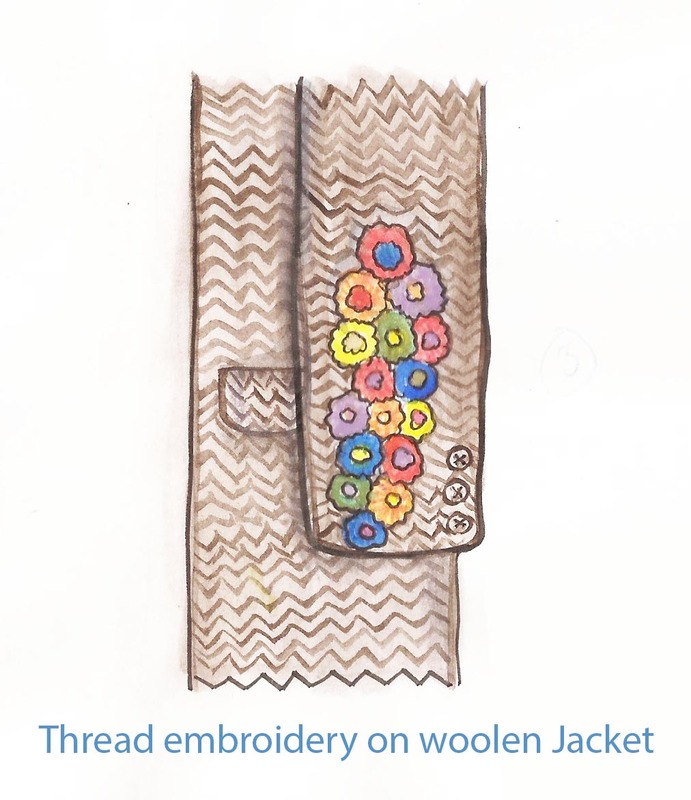 I’ve seen my grandmother stitching beautiful animal and folklore designs along with lullaby’s and poems sewn in for the new born in the kantha spreads. It’s a practice still followed in the Indian heartland. My curiosity led me to a whole new world of similar practices that is part of many cultures around the world. In Japan ‘Boro’ textiles was born of forgotten values of ‘mottainai’ or ‘too good to waste’. The charm of boro lies in the used look and the variations in the shades of indigo. Sewn together over generations, family sagas are woven through the threads. Sasiko which literally means ‘little stabs’ is a form of decorative reinforcement stitching (or functional embroidery) from Japan. Traditionally used to reinforce points of wear, or to repair worn places or tears with patches. 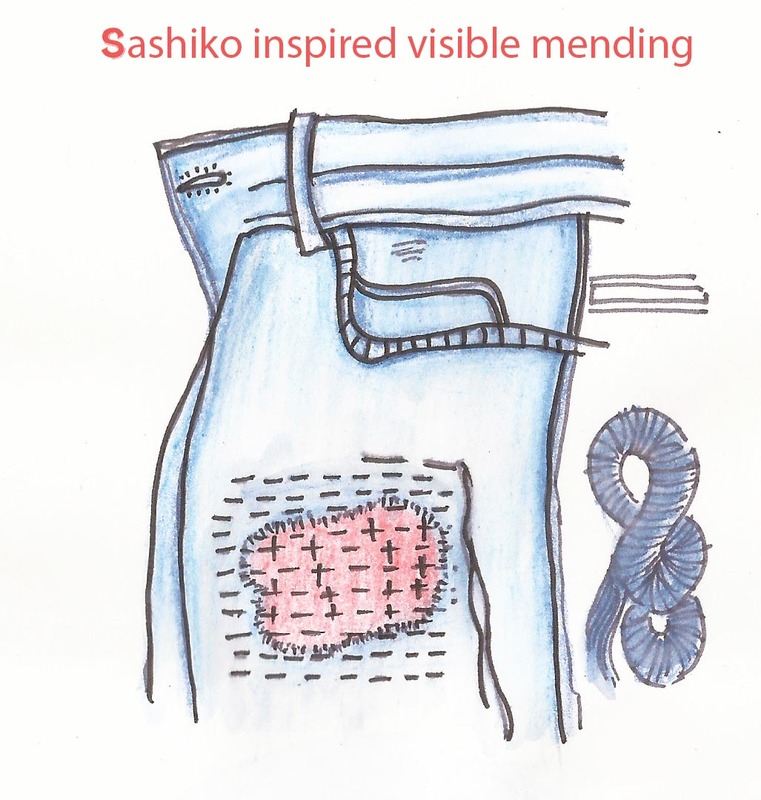 The white cotton thread on the traditional indigo blue cloth gives sashiko its distinctive appearance. ‘Darning’ is seeing a comeback slowly but surely. 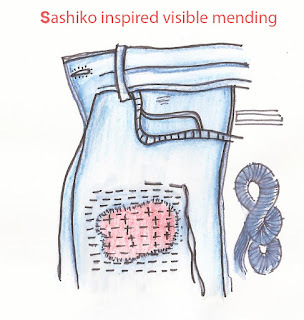 Clever creative ideas of visible mending inspired from sashiko can be looked up online. 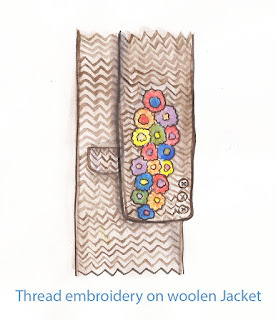 In Nordic countries I stumbled upon similar decorative and elaborate embroidery as visible mending on warm clothes and woolens. Lace mending is a traditional craft in France. Kinstugi is a Japanese art of repairing ceramic with gold. Kintsugi ("golden joinery") or kintsukuroi ("golden repair") is the centuries-old Japanese art of fixing broken pottery with a special lacquer dusted with powdered gold, silver, or platinum. The relevance of these mending techniques can’t be undermined. These processes are mindful way to rejoice what we possess, to restore and reclaim them with care and add value to them as they age with time. There’s a need to acknowledge these traditional mending crafts, the skill involved and bring them back to practice in today’s context especially as we grapple with urban waste crisis. 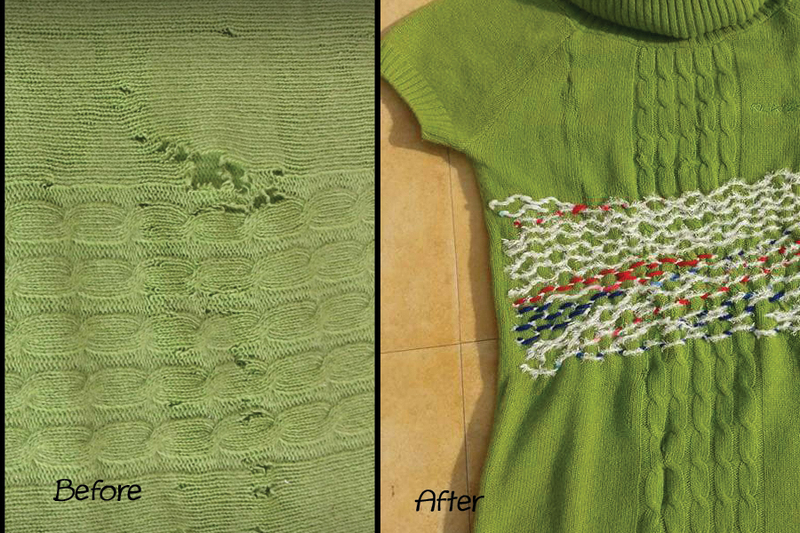 Mending is a slow process. It calls to pause and realign our thoughts and our day to day practices. Perhaps a relook at our habits and behavior towards things we possess. So we can reconstruct a paradigm that enables and propagate virtues of repair & reuse. Nature possesses incredible intellect to repair and regenerate. It’s time we orient ourselves with this critical life preserving process. Somehow we have stop paying attention and as the famous quote goes, To Love, is to pay attention. As individuals, parents and responsible citizens of the world we must usher a knowledge system for our children that is not only sensible and sensitive towards life in general but it establish and recognize critical human skills in the forefront for preservation and value our abilities to recreate the brilliance that we humans have achieved for times immortal. ‘It’s all about thinking inside the box rather than out of the box’ advocates Dr. BA Anantharam, a renowned plastic reconstructive hand surgeon who is a president of Annasawmy Mudaliar CIE’s Public Charities in Frazer Town Bengaluru. He was a former president of Indian Society for Surgery of Hand. Ingenuity is not lost, we bring you an interview with Dr. Anantharam. Bottle with no wine, so question arises ‘What do we do with the bottle, it’s still new? We sat across his cluttered work desk and found his workspace teeming with stories of repurposed items. Dr. Anantharam said excitedly ‘So here is a pen-stand made of out of wood from birch tree which I had picked in Geneva’. He continues ‘you know there are tree surgeons whose job is to focus on health and safety of individual plants and trees’. So here goes the story, one day the Doctor visited a certain shop seeking another piece of that perfectly modeled pencase he used to have. The shopkeeper said that it was one of its kinds. Dr. Anantharam was disappointed and decided to create one for him and till date he continues to surprise himself with self-designed products intended for his various needs. For instance once there was a problem of staining of his shirt with pen ink and lot of time spent trying to use plastic or other materials. The solution was not consistent. Suddenly one day he notices a leather pen pouch with a pen dealer and he cried ‘eureka!’ He realized in leather stock for patients, there will be few scraps of high value leather. Hence, decided to turn them into pen cases.’ He says, showing his custom made pen case ‘it’s made out of calf leather, the more you use it, the softer it becomes but the nappa leather is finest of all’. But there was more on his table that continued to electrify us and one notices another brightly coloured pouch made out of discarded jute ment for special knives for various purposes of his trade. Even his Swiss army knife has a leather holder which was custom made from locally available material. He spins his self-made top made of empty refill and bottle cap on the table while informing that the ‘top is one of the earliest toys invented by man’. Recently in a super specialty hospital when Dr. Anantharam was in a surgery and also at a post –op round he asked for scissors and was handed a blade instead. At AMGH (Annasawmy Mudaliar General Hospital), bandage and scissors are kept ready in a holder out of an empty drip bottle and consequently it take 10 min for a dressing which would take twice the amount of time at other places because the staff are running up and down looking for things the Doctor asked for. ‘Efficiency is the key word, developing a methodology which is optimum in nature. Implementation in hospital becomes an uphill task’, says Dr. Anantharam, but in AMGH this is not the case, while taking a tour in the surgery room, the doctor shows us how various tools are organized the way they should be. How neatly the register is maintained and how the waste paper is being reused. It is impressive to see that staff members understand this virtue of orderliness and follow it diligently. Even a patient contributed by specially designing a surgery steel hand stand meant for surgery of hand. T-20 to T-1 will be the future of cricket where a match will be played in one over with 10 balls in an over. People find test matches too long to endure. ‘Virtual’ cricket may eventually happen say Dr.Anantharam. He mentions that people want consultation online; they describe their pain on a phone-call. That is why there is mushrooming of online portals. He muses ‘what people don’t realize is health is an “IN EXACT” science. They want conversation, but not listening’. Now days an organ transplant is being spoken about but one forgets that with transplant comes anti-rejection medication for the rest of one’s life. In the same breath he adds, Why did Kodak fail ?-- because they did not capitalize the need of conversion from Analog to Digital .Therefore two factors influence the big picture, the access to it and the need for it. We want to thank Dr. Anantharam for sharing his experiences of repurposing and how it’s closely related to efficiency in life which gives us a new perspective on waste. He went on to instruct his colleague to get him discarded pieces of mahogany, sal and teak wood from which he crafts walking sticks, his current hobby.